Have you ever visited Disney’s Fort Wilderness Resort and Campground and admired those wonderful lamp posts with the Mickey Mouse ears? Me too! 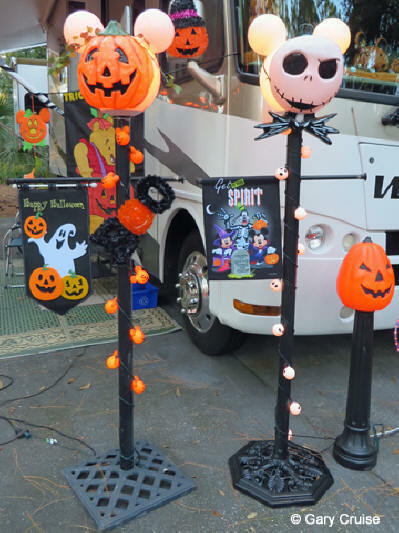 Many of the campers at Fort Wilderness proudly display them at their campsites. They stand about six-and-a-half feet tall and they look awesome! But my wife Carol was determined to have one for our campsite so she did a bit of online exploring and soon found a list of the basic parts required to build a lamp. 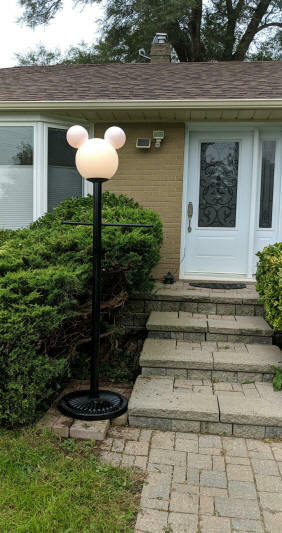 It wasn't long before I had all the parts and I started to work on my very first Mickey Lamp! I was surprised at how easy it was to build! It turned out quite well. So well in fact that several friends wanted me to make them lamps too. I have now made more than fifty lamps and in the process I have refined my technique. 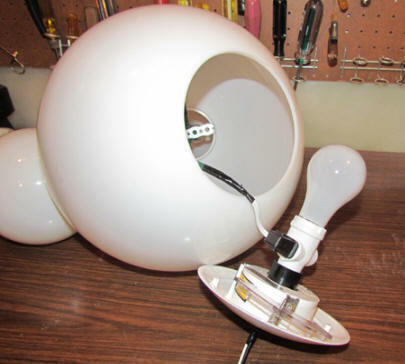 Here are some instructions which you can use to make your own lamp. After all, no true Disney fan should be without one! All of your friends and neighbors already think that you’re a crazy Disney nut . . . why not prove it to them by building one of these beauties! All the parts you need are available at Home Depot. If your local store doesn’t carry all the parts you can easily order them online. The parts to build a complete lamp (including the base and smaller lights to illuminate the ears) will cost you about $150 - $175. Keep in mind I am not a certified or trained electrician and I am simply offering the "how to" that worked for me. 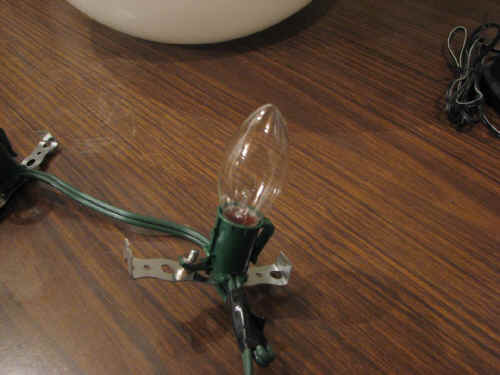 Use caution, always, when building electrical lamps. Seek professional advice as needed. Home Depot online prices as of January 28, 2019 - If you can find these parts in your local store the price may be a bit lower. To do this you simply drill two 3 ¼ inch holes in the 12 inch globe and glue the 6 inch globes into these holes. Begin with the 12 inch globe. 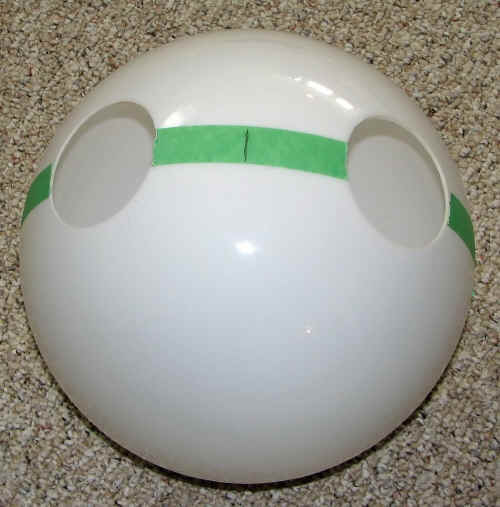 Apply masking tape across the top of the globe along the center line in order to mark the centers for the holes needed to mount the smaller globes. 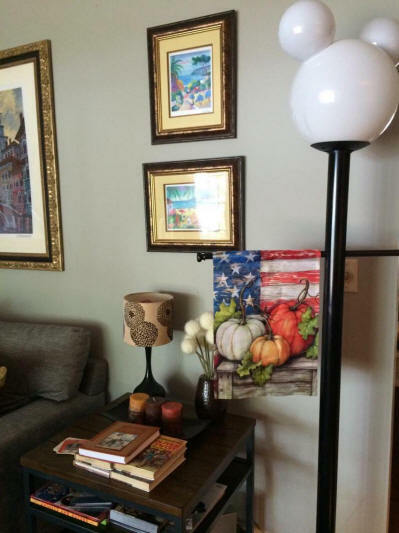 Draw a line at the “top dead center” of the lamp and then measure down 4 inches on each side and make another mark. This will mark the centers for each ear hole; the centers should be 8 inches apart. Drill a small lead hole for each ear and then use your electric drill and a 3 ¼ inch hole saw to cut the ear holes. When you use the hole saw, keep it flat to the surface of the globe and keep it moving at all times. If you stop the saw in the middle of the cut it may jam and crack the globe. Use light pressure, don't press too hard. I have found that the hole saw melts it's way through as much as it cuts it's way through. Just rub around the edges with a file or sandpaper to remove any beads of melted acrylic and you're ready to glue! Remove the tape and glue the smaller globes into these holes, clamp until the glue is set. I use LePage’s Flexible Plastic adhesive which is sold in Home Depot in Canada. In the USA look for Loctite, it’s the same product. 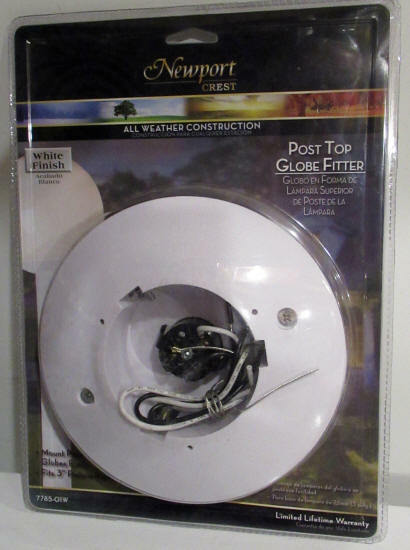 The Globe Fitter attaches to the bottom of the 12” globe and holds the light bulb. It is designed to clamp onto a standard 3 inch metal lamp post also sold at Home Depot. 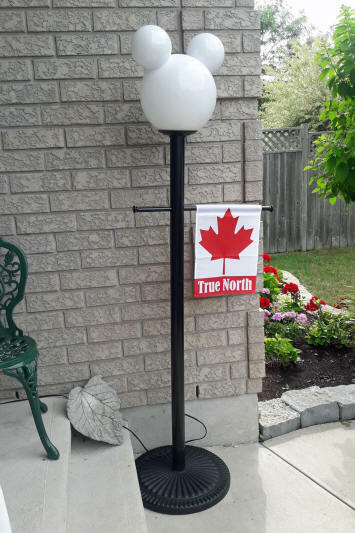 If you already have a lamp post in your front yard it is probably 3" diameter . . . that's the standard size . . . and this fitter will easily clamp on to it. I think it's very important to add smaller bulbs to illuminate the ears as well as the larger globe. It really adds to the effect of the lamp. Begin with a piece of metal strapping, about 4 inches long. Bend about ¼ inch on each end so that the ends will create a “friction grip” on the flange of the 6” globe which is now visible inside the 12” globe. 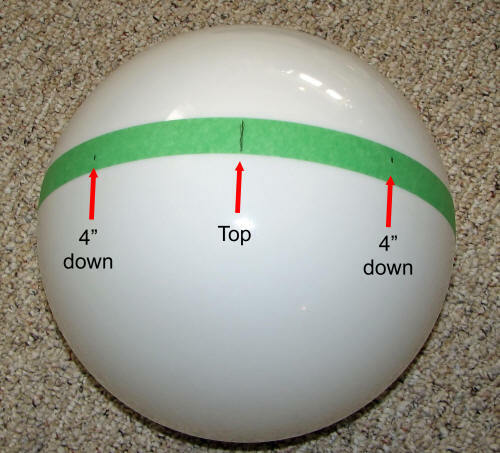 Test it by sliding it onto the flange of the 6" globe (see the picture below) and adjust the length as necessary. It should be a snug fit but it needs to slide easily so you can replace the bulbs. If your light socket doesn't have a little flange to hold a pop-rivet, simply use a hot-glue gun to attach the metal strap to the light socket. When I use a hot-glue gun I also wrap the glued connection with electrical tape to strengthen the joint. 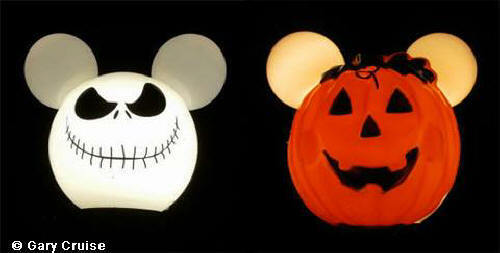 Make 2 of these pieces, one for each of Mickey’s ears. 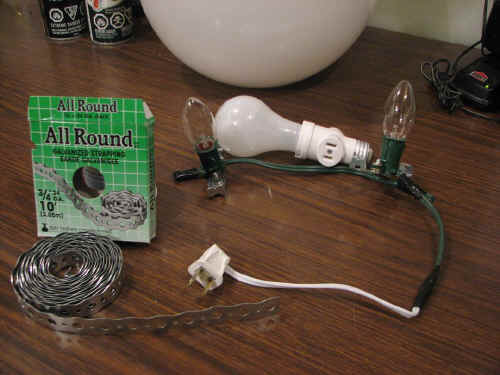 Cut a length of outdoor Christmas lights so that you have 2 socket and enough cord on one end to attach a plug. Use pop-rivets to attach each socket to one of the metal straps you just made. 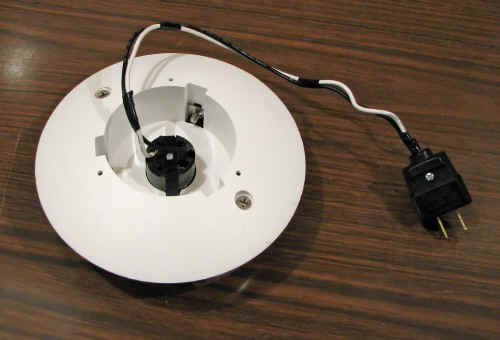 Attach a plug which will plug into the new white socket (pictured at right) inside the globe. Your assembly should look like picture on the left. Here is a detailed look at the light socket riveted to the strap. Note the 90 degree bends in the ends of the strap which provide a “friction grip” on the flanges of Mickey’s ears, inside the larger globe. Bend them to provide a snug fit and just slide them on. Inside the 12" globe - the strap just slides onto the flange of the 6" globe. Plug the string of smaller lights into the globe fitter. You can order a 3 inch lamp post online from Home Depot (search #501817) for $58.90 but your local store probably carries them, along with the mounting bracket (search #502211) for $14.36. If you are going to permanently mount your lamp on a patio or deck, these items are what you need. Just wire it up, install it on your patio or deck and you are all done! 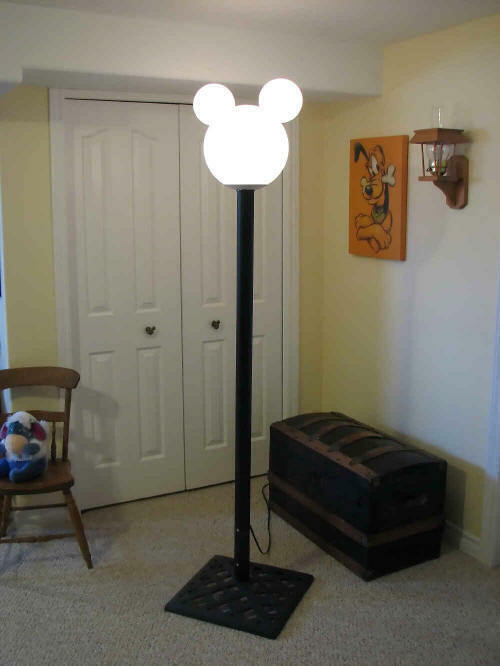 Congratulations, you have just built a Mickey Lamp – don’t you feel proud? 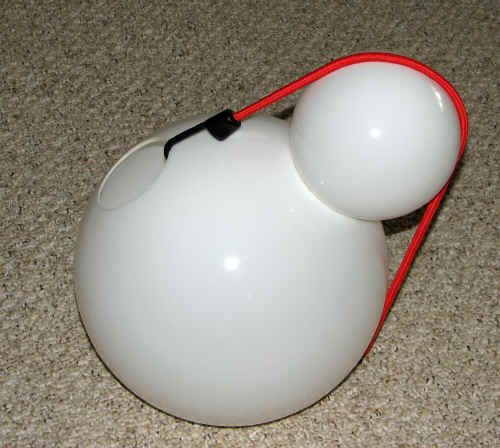 Step 4: Do you need a portable lamp? If you are like me, and prefer to have your lamp more portable, the rest of these instructions are for you! I need to have one that comes apart easily to store in the hatches under our RV. I use standard 2 inch ABS pipe for the post but PVC pipe is very similar and works well too. ABS or PVC is the pipe used by plumbers for household drains and it’s available in any building products store. It’s light, easy to work with and it doesn’t rattle in the RV. NOTE: You do not need any glue! Let’s start by getting the globe fitter ready to attach to the ABS pipe. 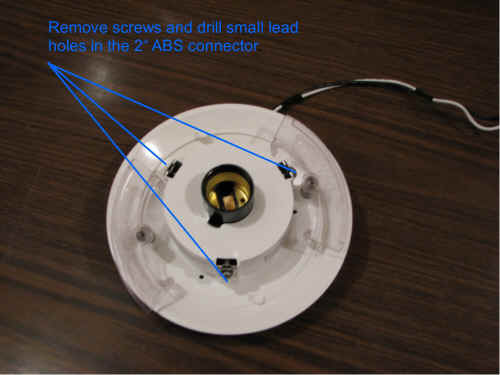 First step: Attach a standard plug to the globe fitter. Insert the ABS coupler in the hole on the bottom of the globe fitter (it’s a very loose fit) and drill small lead holes through the holes where you removed the clamp screws. Use 1 inch screws to attach the coupler to the globe fitter. You have simply swapped the small retaining screws for 1 inch screws which hold the ABS coupler tightly in place. This piece will now slide on and off the ABS or PVC drain pipe which will be your post. This makes it easy to take the lamp apart and move it. Now drill a ½ inch hole about a foot from the bottom of the ABS pipe and feed a length of power cord up through the pole. 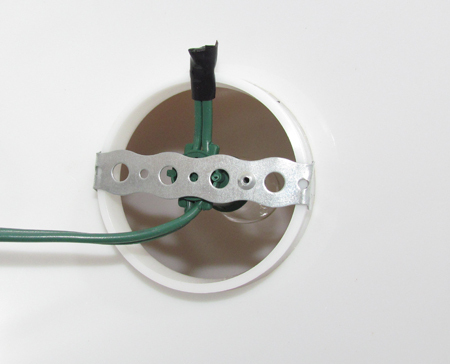 Add a female receptacle to the top end of the cord and a male plug to the bottom. 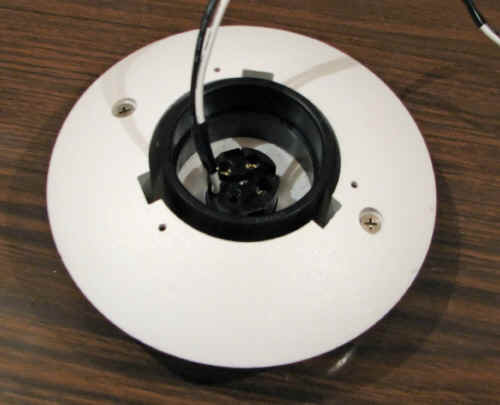 Plug the fitter into the female receptacle you just added to the top; slide the globe fitter onto your post and install a 25 watt frosted light bulb. Place the globe on the fitter and enjoy your lamp. You will need to devise a base for the lamp. I like to use a cast metal base for a patio umbrella (WalMart – about $20 - $25). 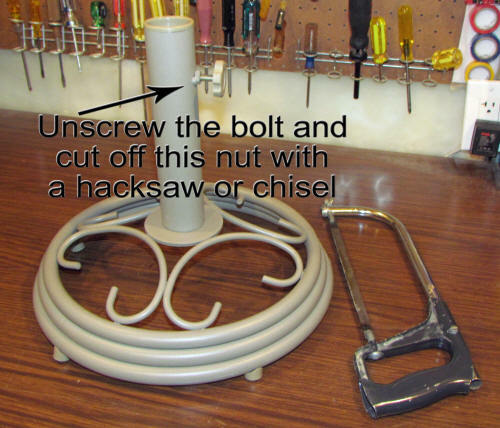 You simply use a chisel or hacksaw to knock off the nut which holds the retaining bolt and the ABS post will slide right over top of the post on the umbrella base. I paint it black to match the post, then drill through the post and the base to secure it with two long bolts and wing nuts. Be sure that your base weighs 20 - 30 pounds or more. It needs to be heavy enough to prevent your lamp from blowing over. The umbrella base has worked very well for me. Christmas tree bases are usually not heavy enough and are not very reliable. I cannot stress it enough - if your lamp is on a portable base your biggest enemy is wind! Be sure to use a heavy base! Would you like to add a cross-bar to the post? A place to hand a flag, pennant or sign? That's very easy to do . . . just cut a length of dowel (or a replacement broom handle) to the length you want and drill an appropriately sized hole through the ABS post. I use 3/4" dowel. Be very careful to keep the holes exactly even so that your cross-bar will be level. Use a drill press if you can, or measure very carefully! Slide the dowel through the two holes and add some decorative end caps. I use wooden drawer pulls from Home Depot, the kind you find on the drawers in your kitchen cupboards. Just screw one on each end of the dowel to add the finishing touch to your cross-bar. Some ingenious folks have used unique things to make a heavy base for their lamp. My favorite so far is an old farmer’s milk can painted in Mickey’s colors, red, black and yellow. It looks great! A custom-built base for Mickey! One of my completed lamps. 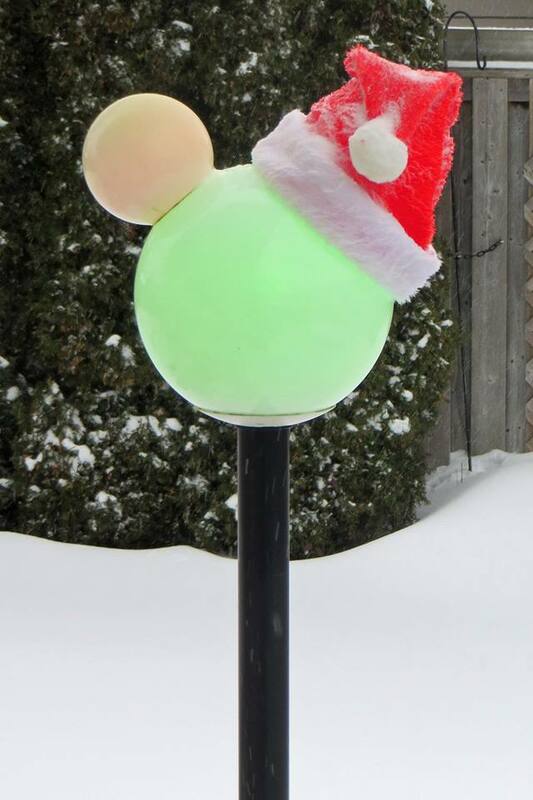 Some people keep their Mickey lamp outdoors! Others proudly display him inside! Wrap the post with lights and add a mask! They look great after dark! Change the bulbs to change colors! 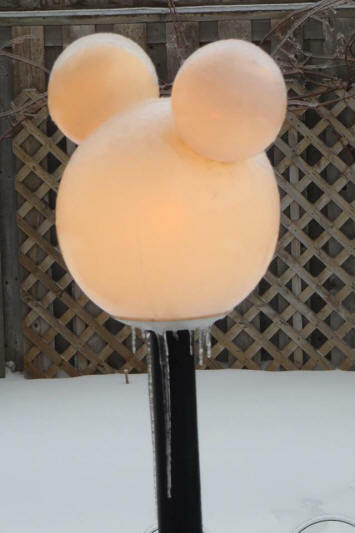 A Mickey lamp is 'outdoor safe' and can stand up to Canada's worst winter weather! Here's a YouTube video our friends Cheryl and Katie produced for their vlog site after they watched me make a lamp. I hope their video will help you put your Mickey lamp together!